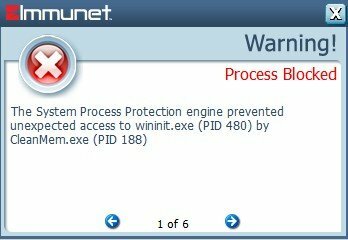 I keep getting annoying pop-ups every few minutes when CleanMem tries to access several system processes which is normal for this software when it looks for & cleans unneeded/no longer used system page file data from the memory modules thus reducing RAM usage which results in a faster, smoother running machine (see images). I added an exclusion for CleanMem.exe but that didn't work. If the pop-ups start getting too annoying I can use Gaming Mode but that's less than ideal since I won't be notified of anything or just kill CleanMem, an app I still want to use. Any ideas? This is off topic but perhaps some consideration should be taken with the next build to include, in Settings, an option to enable or disable this process protection engine for users that do not wish to use it if it's going to be problematic for them. Here is the SHA256 for CleanMem. Thanks for the reply Wookiee. I was told that it is normal behavior for CleanMem to seek out & clean unneeded "Windows System" & third-party software page file data by the developer. That this "is not" some sort of malicious intent or spying on the user and I believe him. I've been using CleanMem for a number of years with no problems. That's not to say I don't believe you, the app seems to still be functioning but I am certain it would work even more efficiently if it had access to those blocked Windows processes that it was designed to check. 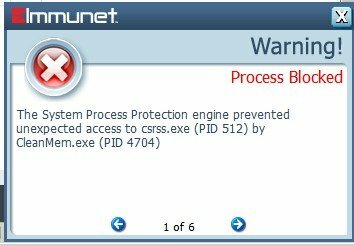 I still think that it might be a good idea if it was left to the user to decide if he/she wants to use the System Process Protection feature. Another idea would be for users to apply their own custom exclusion rule-sets to the process protection. That might be an even better option! That way the process protection needn't be completely disabled then. I do use Comodo Firewall that has a very similar in function H.I.P.S. feature that's included with the firewall software package. So for now I'll have to continue using Gaming Mode every time I boot up I guess. The devs are looking into finding a better solution for this.